During the early 1960s, newspapers in Ireland had a keen ear for native lake monster stories; their own counterparts to all the media attention spent on Loch Ness. It was only a matter of time before a few readers decided to step forward and submit personal entries regarding the phenomenon. Soberly and without a doubt we are convinced that we saw a creature which could only be described as a monster. Looking down into the lake which was perfectly clear (i.e. calm) in the evening light we saw a large hump like the back of a rhinoceros emerge from the water. Ripples spread out to each side of it and then a head something like a tortoise only many times bigger broke the surface. It came up about three feet above the surface of the water, moved slowly around and swam forward a few yards. As it did so the body was clearly revealed, circular and not less than ten or twelve feet in circumference. It was a dark greyish colour. Suddenly and silently the creature seemed to dive and smoothly vanish leaving an agitated swirl of water. We saw it for not less than three minutes. Comparing our stories we found them to be identical to a surprising degree although my friend thought the head was more like that of a swan. 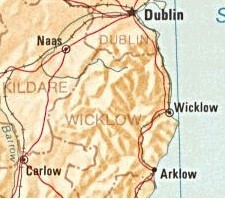 The twin lakes, Upper Lough Bray and Lower Lough Bray both sit in a remote area of the Wicklow Mountains only 12 air miles south of the center of Dublin. Lower Bray has a triangular body of water which never exceeds 1/2 mile on its sides. Both Upper and Lower Bray are reputed to be deep. Divers enroute to Lough Bray. At an elevation of 1,228 feet, sightings in Lower Bray echoe of the mountain wurrums of Kerry. The animals would need to be capable of negotiating an upward climb only to reach small bodies of water sparsely stocked with fish. The Autumn 2000 issue of the British Columbia Scientific Cryptozoology Club Quarterly cited a curious observation had by an individual researching his doctoral thesis on glaciations near Lough Bray. While resting well above the twin lakes he caught sight of a strong "V" shaped wake slicing through the water by an unseen force. British Columbia Scientific Cryptozoology Club Quarterly: Issue 41, Autumn; 2000 "Cryptids in Ireland" by David Davies. Legends of St. Kevin's hermit days in the hills of Wicklow tell of his own experience dealing with a sinister water beastie. St. Kevin's tale holds considerable contrast for the traditional Saint vs. Serpent stories. While the locals were keen on Kevin performing the standard banishment on a lurking water beast, the saint shrugged of the requests letting the animal live in peace. In some traditions St. Kevin is even said to appreciate the monster's role in the local ecosystem: eating pesky pilgrims insistent on bothering the holy hermit!